Welcome to my cookbook. 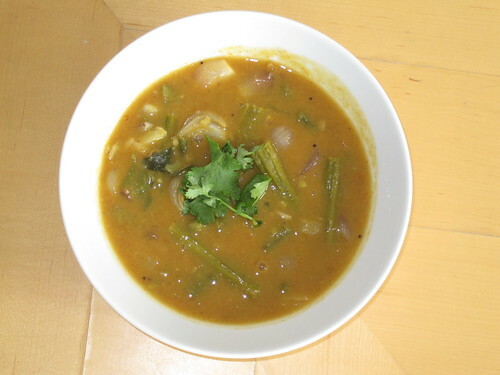 Today my recipe is Drumstick Dal Sambhar. It is a famous South Indian recipe. It is called as parrupu kulambu. Here, drumstick can be replaced with any vegetable. 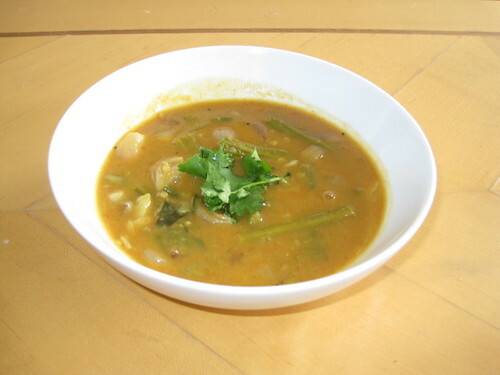 The main ingredients are toor dal and vegetables. It goes well with hot rice. Wash toor dal and soak it for 15 minutes. Here oil is added to dal to prevent sticking to each other. Heat oil in a wok, add redchilli,mustard,cumin,garlic,curryleaves and hing. Now add onion,greenchilli and fry them well. Add tomato now and fry till it become soft. Now add drumsticks and mix well for minutes. Add sambhar powder and fry well with drumstick and tadka mixture. Fry the mixture well for few minutes. Its time to add boiled dal to tadka mixture and mix well with drumsticks. Add water if needed, allow it to boil till drumstick cooks well. Soak lemon size tamrind in water and squeeze the juice from it. Check salt now and add tamrind juice to dal. Boil it well for 10 minutes. Add coriander leaves to dal. Now,drumstick dal is ready to serve. Drumstick dal can served with steaming hot rice and vegetable fry. Hope all would like it.